Today's image is a blend of three photographs: the red dress is from a shop window in Honolulu; the coastal photo is from Acadia National Park in Maine; and the top part of the sky above the hook is from another Maine image. This is a recent collage created specifically for a short session on Creative Collage that I taught at FOTOfusion last week in Delray Beach, Florida. I really like how this one turned out. I feel it has just the right amount of quiet surrealism that is necessary in a collage. 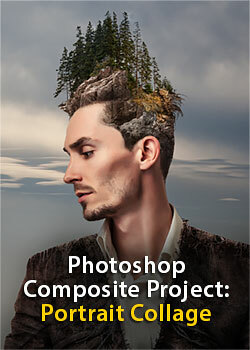 For an in-depth exploration with plenty of time to work on your own images, the ideal class is a 5-day workshop called The Creative Collage with Adobe Photoshop CS3 that I'll be teaching June 2 - 6 at the excellent Lepp Institute of Digital Imaging on the central California coast near San Luis Obispo. These classes tend to fill fast, especially at that time of year, so if you are interested in participating, click the class title for a link to the workshop's page at the Lepp Institute site. The computer lab at the Lepp Institute is really first rate, with fast Windows computers kitted out with dual monitors and Canon 5100 printers (as well as larger format printers adjacent to the main lab area). Tiered stadium seating ensures that everyone has a clear view of the main screen. I've taught there several times over the past five years and I always look forward to going back. It is truly one of the best digital lab facilities I've taught at. If a shorter version of that class will fit your schedule better (or if you're hankering for an excuse to make a trip to Hawaii), then I'll be teaching a 2-day version at the University of Hawai'i at Manoa in Honolulu on April 12 - 13. I'm re-working the syllabus for both versions of this class with new material that takes advantage of new features in Photoshop CS3. When I have that finished I'll post a link to it here. Stay tuned! Here's another view of the cool clouds shown in the previous post, this time with the landscape included. In answer to the obvious question that this image may raise...yes, that amazing sky really was above this causeway when I took the photo. This is a collage of two shots taken sequentially, but I took the two shots merely to increase the number of pixels so that I would end up with a larger file from which I could make a larger print. In the spirit of the interpretive landscape image, I have obviously done some fairly significant dodging and burning here as well as some selective sepia toning, but the sky is not imported from another scene. It was an amazing and wonderful moment, as I can never recall being in a place where a triangular shape in the landscape was echoed so perfectly by a triangular shape in the clouds.Another aspect of this image that I find intriguing is the fact that the water on the left is rippled and unsettled, while the water on the right is calm. This is all the more noteworthy since the water on the right is the side that faces the open ocean, while the water on the left is the protected harbor side. Every once in awhile I post what I call "anniversary" images: photos taken on the same date a year or more previously. I haven't done this for a while and so today I was prowling through my archives looking for a an image to use for a book prooject when I came upon this photo. Technically it's not a true anniversary image since it is not from today's date (June 5th), but at three years and one month from today's date, it's pretty close. I found this moth on our deck. While still alive, it was certainly not feeling very chipper. I placed it in a shallow, open box and put it out of the way in case it decided to fly off. After some research on the web, I was pretty sure that I had it positively identified it as a male Polyphemus Moth, also known as the North American Silk Moth. In the course of this research I found out about the unusual life cycle off these insects. They emerge from their cocoon and find a mate on their first night on the wing (they use their large antenna to "sniff" out a potential date). Then, after accomplishing their reproductive imperative, they wait around to die. They don't even have a mouth with which to eat. So, they can't even have a snack after a night of moth romance! Once I realized that this moth was on the way out of this world, I decided that it certainly warranted some photographs. This is not a Photoshop composite, by the way. It was a pretty a large moth and this is a straight shot (apart from some interpretive sepia toning). To get an idea of just how large it is, consider the photo below. That is a standard-sized CD the moth is resting on! This image is also more representative of the moth's actual color (click in the image to see it larger). Today's image is from the tiny village of Chimayo, north of Santa Fe, New Mexico. This was taken last summer during my workshop at the Santa Fe Workshops. In addition to a very famous old adobe church known the world over for the healing qualities of the soil (the last time I was there a priest was giving a small ziplock baggie to a Dutch family so they could take some home), Chimayo is also home to this very picturesque chile stand, where you can purchase bona fide "Holy Chile". Not only is the chile holy, but it's also very, very good. So good, in fact, that I am really looking forward to returning to Santa Fe to teach another workshop in late July and early August (see below for details). I've already burned through the supply I picked up last July and I have a powerful need for more of the good stuff! This week's featured workshop is still a ways off, but if you're interested in a week of creative Photoshop and digital photography (including panoramas, HDR, multiple image composites, diptychs, triptychs and more), then consider joining me in Santa Fe, New Mexico this summer for my Creative Digital Darkroom workshop.The workshop is based on concepts, philosophies and techniques that are covered the book I am currently finishing up with Katrin Eismann, The Creative Digital Darkroom, due out this fall from O'Reilly Media, Inc. 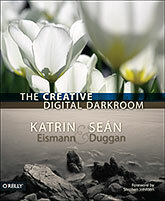 The digital darkroom lab at the Santa Fe Workshops is one of the best I have ever taught in. Each student has a G5 Mac with a cinema display with access to an HP Designjet pigment printer. 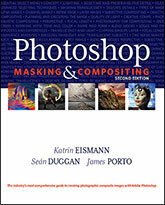 We'll be exploring all the cool new features in Adobe Photoshop CS3 as well as Photoshop Lightroom. We'll also have some photo excursions during the week for practicing creative camera and exposure techniques, including a foray into the magic of night photography. Taken with a plastic Diana camera just about a month ago during my second March sojourn to Las Vegas. I just love kitschy displays like this. At the moment I have the mother of all backlogs in terms of Holga, Diana and pinhole negatives that need scanning (and 6 more processed rolls from the Hawaii trip are due to arrive this week). Work, work and more work is keeping me from setting aside quality time with the scanner. Hopefully my schedule will lighten up in another month or so and I can delve into the stack of tempting negatives. This week's featured workshop is two months away and there are only 3 spaces left. If you're interested in a week of learning creative digital photography, digital darkroom workflow and Photoshop techniques, then consider joining me on the beautiful coast of Maine for my Real World Digital Photography I workshop (there is also a level II version in late September that builds on what is covered in the first class).The workshop draws on concepts and techniques, both photographic and those in the digital darkroom, that are covered the book Real World Digital Photography that I co-authored with Katrin Eismann and Tim Grey. Additionally, we'll be covering new developments, such as Photoshop Lightroom. In the digital lab each student will have a Macintosh computer loaded with Adobe Photoshop CS3 and Adobe Photoshop Lightroom. In addition to our time exploring digital workflow and creative image enhancement techniques, we'll also have photo excursions during the week for practicing creative camera and exposure techniques at interesting nearby locations. Click the class title above to register. For the past five years I have written the Photoshop tutorial column for Layers Magazine (for the first two and a half years it was MacDesign). Layers is a very cool magazine covering creative software from Adobe Systems. 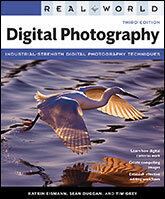 The magazine comes out bi-monthly and, in addition to Photoshop, it covers Adobe's most popular creative programs (InDesign, Dreamweaver, Flash, Illustrator, Lightroom, Acrobat & After Effects), as well as other news and features related to the creative design, production and photographic communities. It's published by from the same folks who publish Photoshop User and put on the ever popular PhotoshopWorld twice a year. Today's post represents the debut on this blog of my Layers Photoshop columns in PDF format. I will be posting them periodically (approximately every month or two), along with the images that you need to work through the tutorial on your own. The first tutorial is from the Jan/Feb 2007 issue. Please note that my schedule is pretty full and I am not available to provide email tech support for these tutorials. This tutorial is about the photographic setup for an intentional collage and covers the steps I used to take the three source images seen below and collage them into the final image (shown above). Below are the links to download the tutorial files. You will need to either unzip or unstuff the image files; I have posted both a .zip and a .sitx version of the image files (both contain the same files). 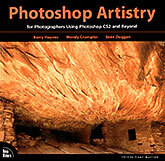 Copyright Info: These images are only for your use in completing this tutorial. They may not be used for any other purpose. This exposure was approximately 4 seconds long. I closed the cover on the pinhole, lifted the tripod up and jumped out of the way just before the incoming surf reached my feet. For another view from this session taken with a digital SLR, as well as the story behind the shoot, follow this link. This is a single exposure, 8 seconds long. 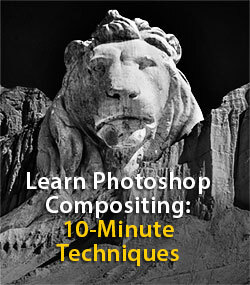 The only Photoshop work is tonal and contrast-oriented as well as some selective sepia toning. I created the fluttering pages by using a very long and thin twig to gently move two of the pages back and forth during the 8-second exposure. I wore dark clothing so that I would not register in the image. The book was published in 1818.